Wood doesn't tend to have such strong variation in colour, the texturing is more subtle. Try using some of those darker colours for shadows instead of texture. Also, are you sure a wooden lamp is a good idea? Seems like it'd catch on fire, or at least get charred and brittle after a few months. A wooden post might be fine, but perhaps the top part should be stone or metal? Hello. I can’t draw a wooden street lamp. Any ideas to fix this? I will be grateful. Dude, I am out for holidays but I can color-reduce it after when I get to my PC. Meanwhile, you can try to take the colors that are most close to each other and merge them into one intermediary color. Do it a few times until every color is different enough from the others. I remember the piece you posted, and it looked alright regarding color balance. Just cut out too similar colors. Hey guys! I do not know English, so I am writing with the help of a translator. I draw graphics for my game, but I don’t understand the color palette, etc. I drew a little bit, I see that there is a difference in colors. Help me create from this a full palette that I can use. Try focusing more on the wood grain. In the posts, the grain is going to be vertical. 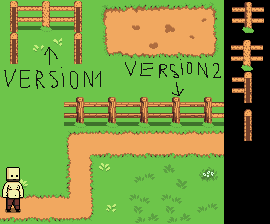 I based this edit on the idea that the posts were small logs. On the bars of the fence, the grain will be more horizontal. Wood has a pattern to it, not just a texture - follow the lines of the grain. Also consider your light source. The fence is going to have more light on the top bars and less near the bottom. The heavy top outline makes it feel off. Hi, what do you think about these 2 new releases? which is better? I'm using an interpreter, sorry for the crookedness. Please help me balance the colors if necessary. It seems to me that my character is too big compared to other tiles (64x64), and my tiles (32x32), is this normal?